Land Rover Owner International is the original and world’s best-selling magazine for Land Rover and Range Rover enthusiasts. 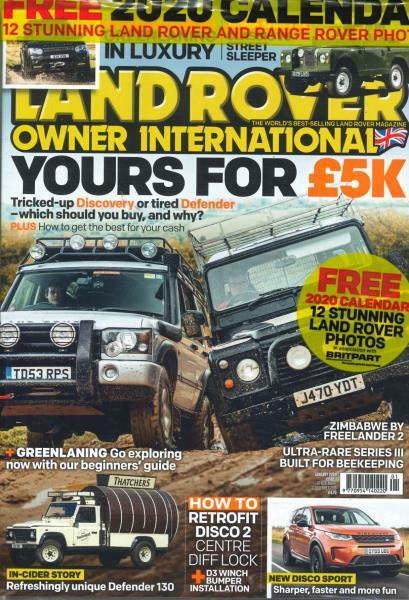 Buy a single copy or subscription to Land Rover Owner magazine. Every issue of this best selling magazine is aimed to help readers buy, maintain, repair, restore, modify and drive their Land Rovers, as well as inspiring them with travel adventures from the UK and overseas. Our practical writers know their Land Rovers inside out, and our adventure writers have been there and done it, showing the best routes to drive and offering top advice for maximum enjoyment. Enjoy reading a print subscription to Land Rover Owner magazine and benefit from having it delivered directly to your door and at a discounted price.